Shopping for Six Million Dollar Man Action Figures? Rare warehouse find! Limited quantity available. 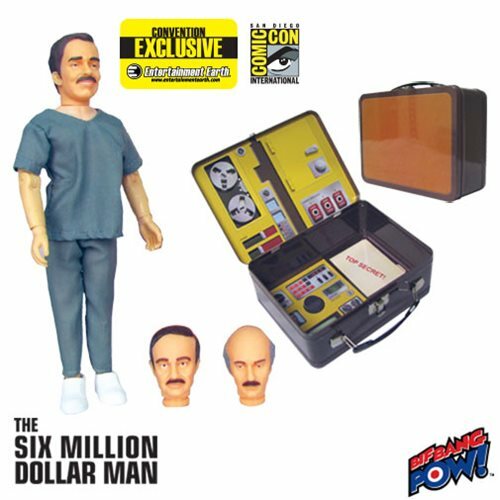 Exclusive action figure and tin tote based on The Six Million Dollar Man. Includes Dr. Rudy Wells, Steve Austin's physician. The lunch box emulates Oscar Goldman's briefcase. Better, stronger, and maybe even faster! Entertainment Earth Comic-Con Exclusive! Standing 8-inches tall, this retro-style Dr. Rudy Wells Action Figure based on the TV series The Six Million Dollar Man features multiple points of articulation and series-true fabric clothing. And Steve Austin's physician arrives in an awesome tin tote that emulates Oscar Goldman's briefcase! It looks like an ordinary brown briefcase on the outside, but the full-color interior features artwork representing the decoder, bionic scanner, tuner, energy modules, and other gadgets and gizmos you remember from the show. Only this briefcase-styled lunch box won't explode! The tote measures 9-inches wide x 6 3/4-inches tall x 4-inches deep. Limited edition of 1,500 pieces. Dr. Rudy Wells, Steve Austin's physician and bionic-technology expert, appears in this action figure dressed in authentic scrubs and white shoes. Dr. Rudy Wells features interchangeable heads depicting all three actors who played the part: Martin Balsam, Martin Brooks, and Alan Oppenheimer! The Six Million Dollar Man is an American television series about a crippled test pilot and former astronaut who is rebuilt with nuclear-powered limbs and bionic implants. Working for the OSI, he serves as a truly one-of-a-kind intelligence agent. The popular show aired on the ABC network as a regular series from 1974 to 1978. Ages 14 and up.